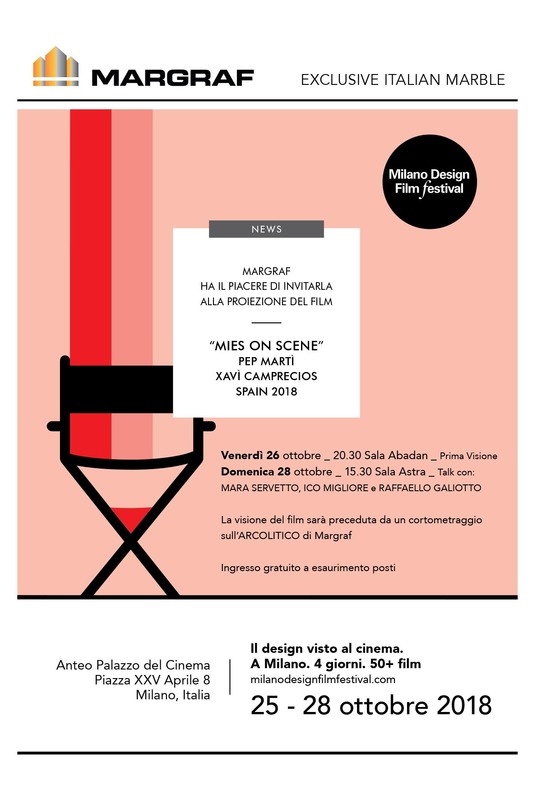 The Company has chosen to support the 2018 edition of the Milano Design Film Festival to consolidate the culture of marble in architecture and believes that the film “Mis en Scene,” directed by Pep Martín and Xavi Campreciós, is a perfect example of the synthesis between artistic narrative and promotion of stone. The veined marble laid in book-match style that Mies Van der Rohe chose for the Barcelona Pavilion is the protagonist of the spaces and after many years is still an essential element of contemporaneity. The film will be preceded by a short film of the monumental work Arcolitico – an experimental parabolic arch in Fior di Pesco Carnico 14.5 meters tall, designed using futuristic parametric software and cut entirely with a CNC wire frame – inaugurated in September 2018, at the new Margraf Area in Gambellara (VI) – the largest showroom in Europe for the exhibition and distribution of marble.